Eating at the bar is second nature to me. 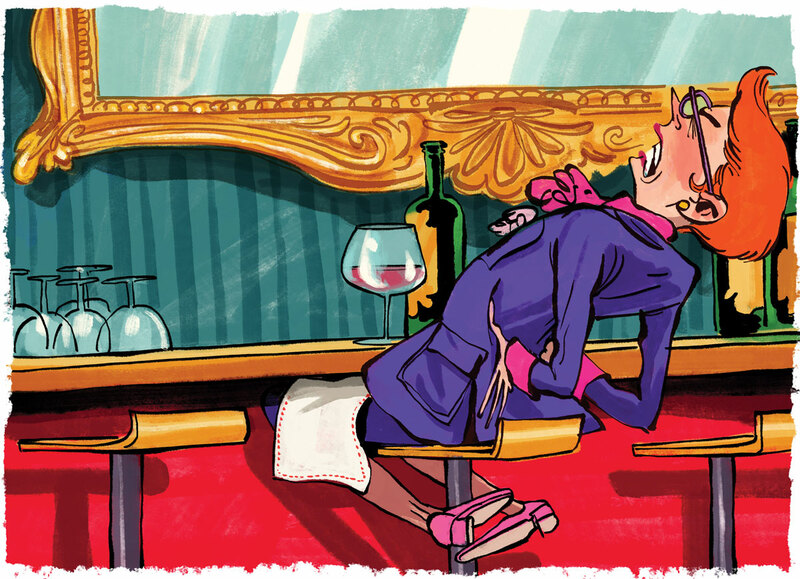 Because I am fidgety, impatient, and generally unwilling to put up with the bowing and scraping of service, I often prefer to hop onto a barstool rather than wait for a table. When I sit at the bar, I have a clear line of communication. If I want something, I can ask directly. But for all the pleasure I take in sitting on a barstool, my backside and I are frequently uncomfortable. Unless I’m at a real diner such as Home Grown, where the seats at the counter are padded, floor-mounted little numbers straight out of the 1950s, I can’t stand backless barstools. It doesn’t matter if there’s an upholstered seat on your farm-style or artsy modern stools; I need something with armrests and a comfortable back. As an inveterate “barstooler,” I want restaurateurs and their designers to pay more attention to what it’s like for women to take these seats—which can be a real challenge when you’re wearing a skirt. I am short and not that slim. For me, mounting a too-tall stool without a footrest is an undignified exercise, especially if it’s too light and possibly shaky (bentwood alert!) or made of cold-to-the-touch aluminum (great at an outdoor bar, bad inside). Crushed velvet seats don’t work for me because I can’t scoot back or forward. I’m also incredibly curious and therefore prefer my barstool to be the swiveling kind. Thank you, Ticonderoga Club and Golden Eagle, for your perfect stools! In France, where I’m from, we have a thousand sauces and not an instance of gravy. Yes, we have jus, but unthickened meat juice can’t compete with the heavy, comforting gravy I consume by the bucket on Thanksgiving or the other variations I seek out the rest of the year. Luckily, I live in the South, where gravy is a religion. Among my favorite gravies: white ones made with bacon fat, flour, milk, and, if you’re lucky, crumbled sausage (a good version is served over fluffy biscuits at Home Grown); deep brown ones that start with pan drippings and end up on mashed potatoes (found at places such as K&K Soul Food and Magnolia Room); thin red-eye ones made by splashing coffee in the frying pan used to cook country ham (go to Silver Skillet in Midtown for a classic, deliciously salty take). 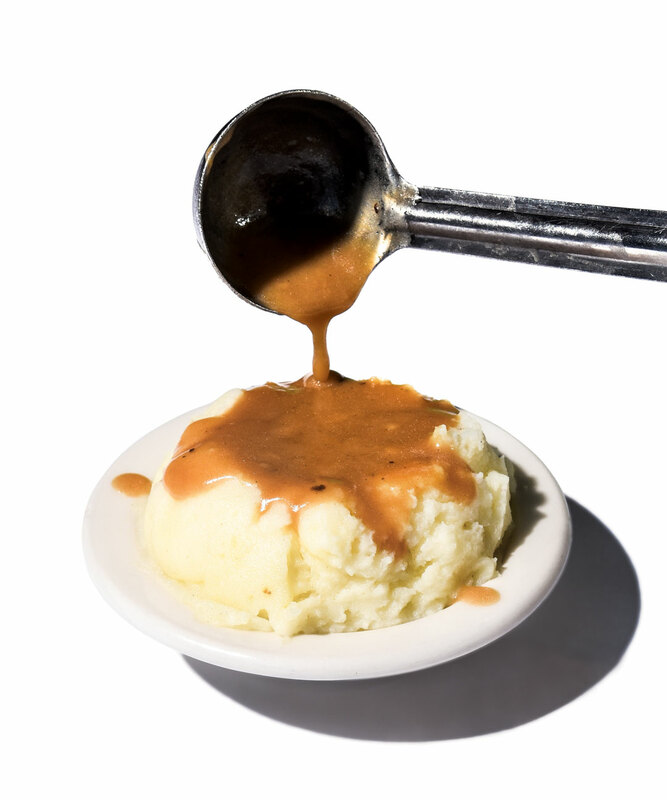 Want to try to make some of Atlanta’s best gravy? In the new cookbook that Eddie Hernandez of Taqueria del Sol co-wrote with Susan Puckett, Turnip Greens & Tortillas: A Mexican Chef Spices Up the Southern Kitchen, Hernandez offers the recipe for his coveted tomato and habanero gravy. It’s divine on meatloaf.